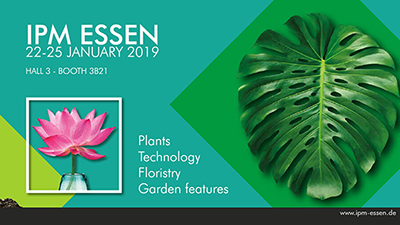 21/01/2019 - Biobest has chosen IPM Essen, the world’s leading horticultural trade fair, to promote its multi-pronged IPM solutions for thrips, mealybug and sciarid control in pot plants. A wide range of ornamental crops are highly susceptible to damage from thrips, mealybug and sciarid - three challenging pests. To maximize effectiveness, Biobest’s biocontrol strategies target each pest above and, where appropriate, below the soil surface. For example, for effective control of thrips Biobest’s multi-pronged strategy combines monitoring with control solutions above and below the soil surface. For above ground control, the programme consists of Bug-Scan® blue in combination with Thripher pheromone, the predatory mites Swirskii-System (Amblyseius swirskii) and Montdorensis-System (Amblyseius montdorensis) with the feed supplement Nutrimite™. Foliar applications of the parasitic nematode Steinernema-System (Steinernema feltiae) are also recommended. The soil-dwelling thrips pupae are targeted in the soil with Hypoaspis-System containing the predatory mite Stratiolaelaps scimitus, the predatory beetle Atheta-System (Atheta coriaria) and the parasitic nematode Steinernema-System. Do you want to find out more about these effective strategies? Visit Biobest at IPM Essen in Hall 3, booth 3B21.